Are you a rice lover? 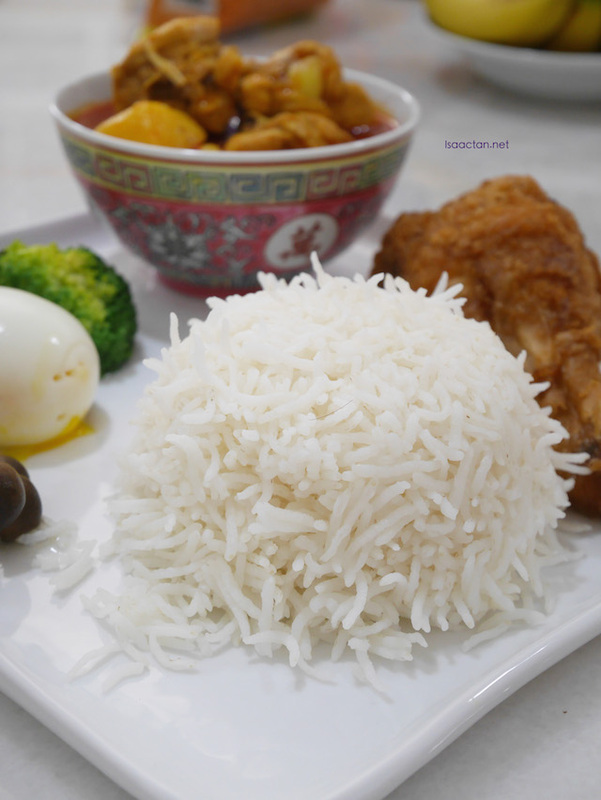 I'm sure most Malaysians have to get some rice on their plate as it has become a staple every meal. I myself am a lover of specialty fragrant rice, namely the Jasmine rice. 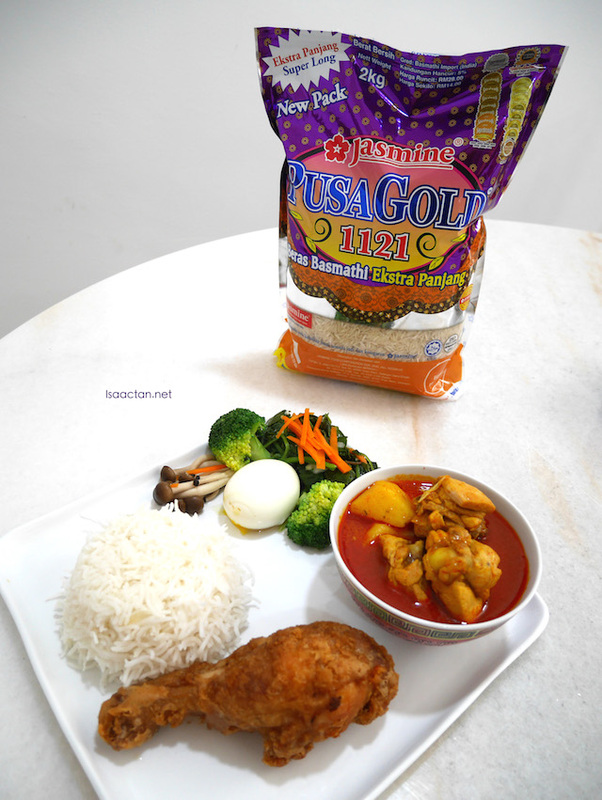 Just last night, I've had the Jasmine PUSA Gold 1121 rice together with some nice home cooked chinese dishes, together with some which I 'tabao-ed' including a rather nice curry chicken. Today's title shall be aptly named "Tonight's Dinner with Jasmine Rice - PUSA Gold 1121". Packing back some of the dishes, together with curry chicken which is home cooked, we cooked the Jasmine PUSA Gold rice at home. 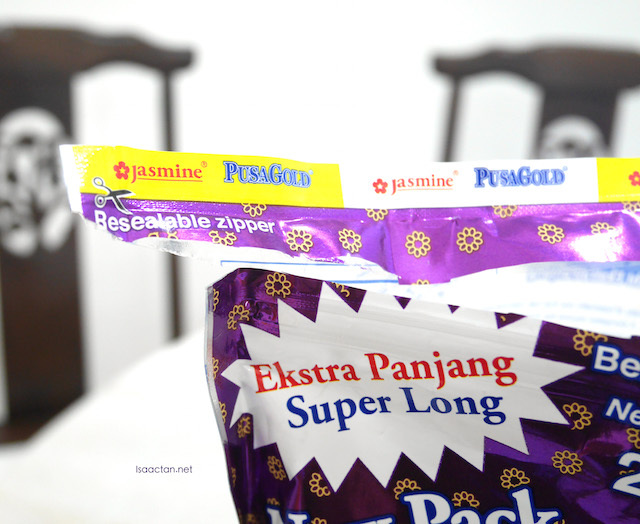 I found the packaging to be very eye catching, purple being the main theme, 2kg with extra long basmathi rice inside. 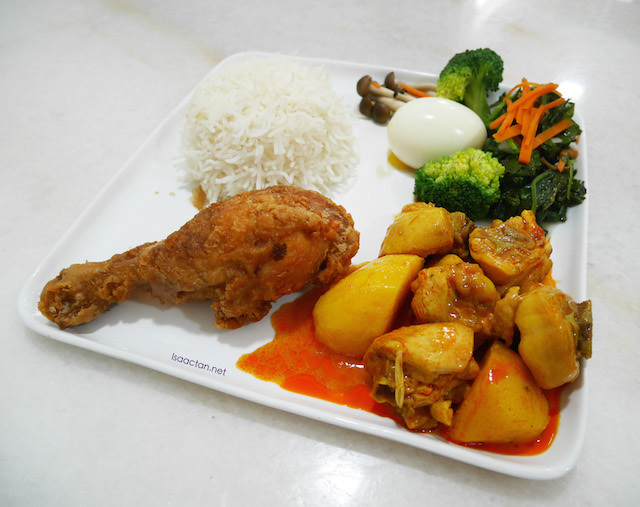 This time around though, I decided to cook it just by steaming the rice, to be taken with the dishes by the side. A short education on the PUSA Gold is in order. 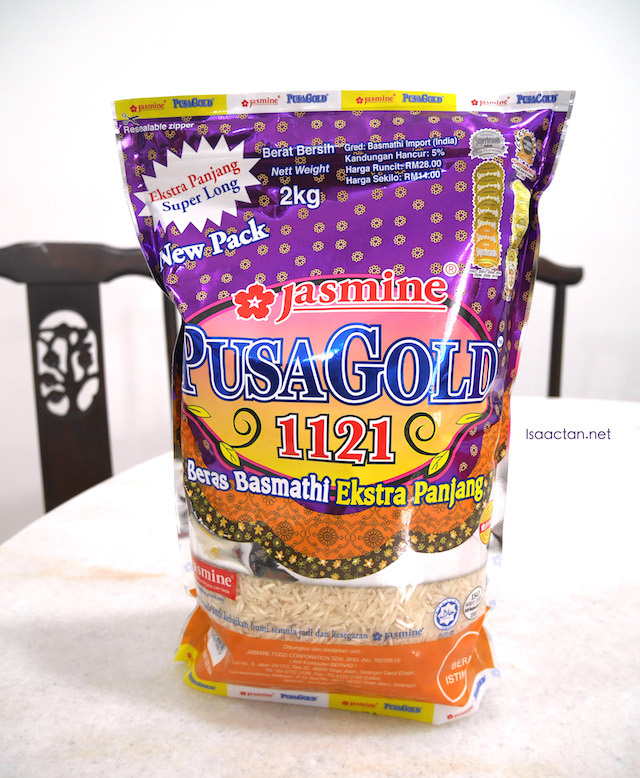 The PUSA Gold is a unique variety of basmathi rice that has captured the imaginations of consumer. 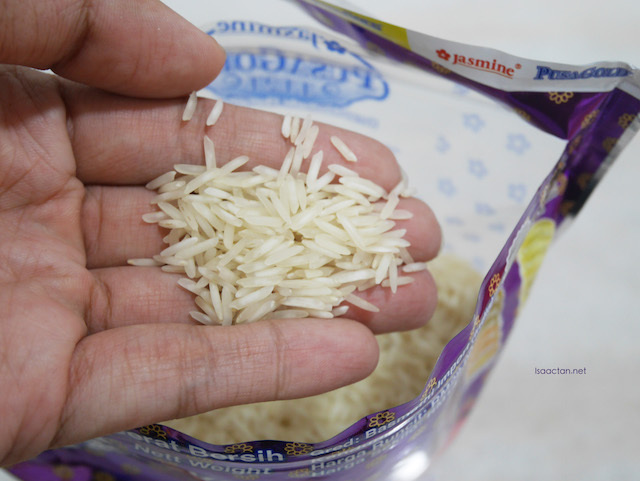 It elongates beyond the characteristically long lengths basmathi rice is known for, after cooking. Grown at the foothills of the Himalayas in the Punjab, it benefits from the cool climate and clean, fresh waters of the mountain ranges. PUSA Gold basmathi retains the aromatic, soft and non sticky, loose feel features that is inherent of basmathi variants. The combination of all the above factors make for a rice with unique taste and texture. Of course, cooking briyani style is best suited for this rice, but it's also good to be taken as it is, with curry on the side. Cooking the rice didn't take too much effort, and before I knew it, my dishes were all laid out in front of me complete with one huge fried chicken thigh, curry chicken, a piece of hard boiled egg, and green broccoli and vegetables on the side. 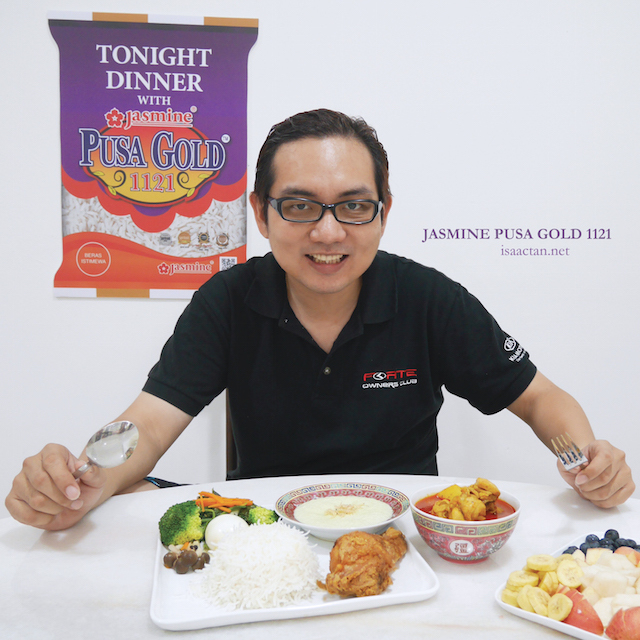 Simple, yet delicious, and the aromatic Jasmine PUSA Gold rice complemented the dishes really well. 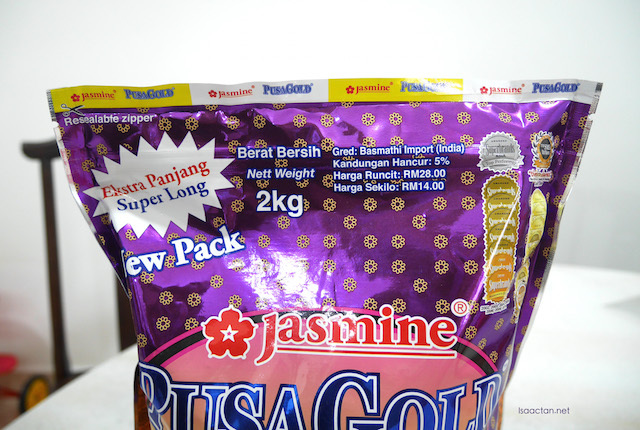 What gets me excited when eating Jasmine PUSA Gold basmathi rice would be the fact that the rice texture is firm outside, yet soft inside, without sticking together or breaking apart when being stirred. It goes exceptionally well with curry, absorbing the flavours inside. seriously the rice looks good. :-) just to check with u, Jasmine is from which country already ah?